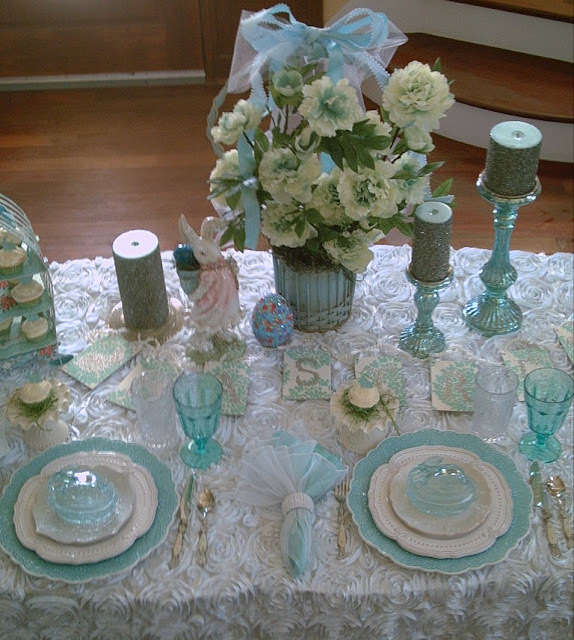 Valerie, your table is so pretty and elegant. I love those soft colors. 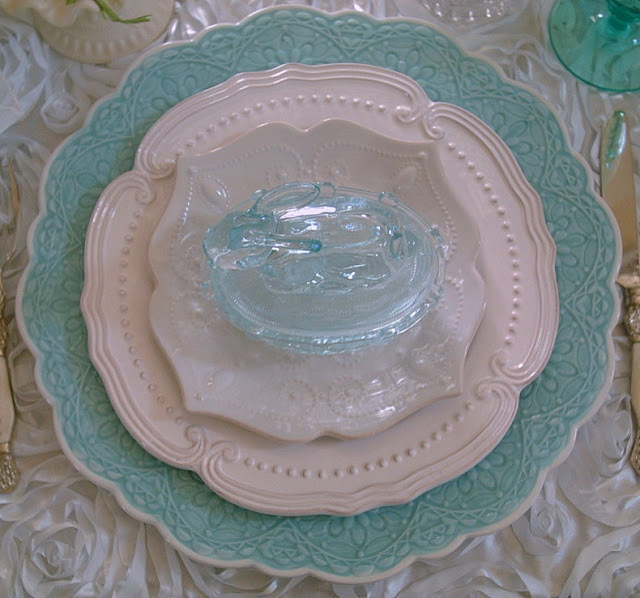 the plate stack is gorgeous! Your goblets and cute little aqua bunny all compliment this pretty setting. 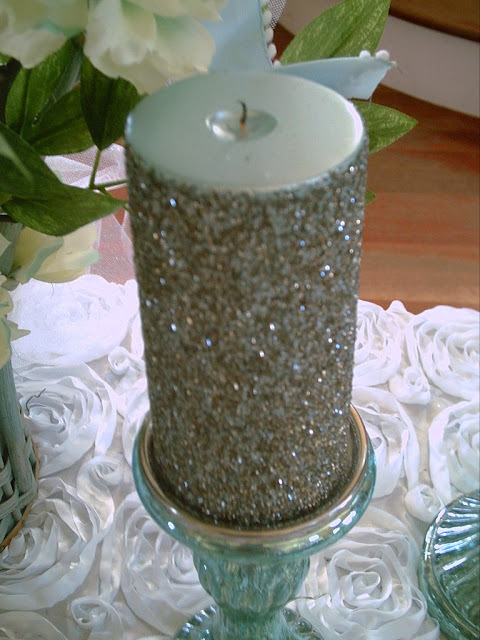 Even the tall candle holders match. 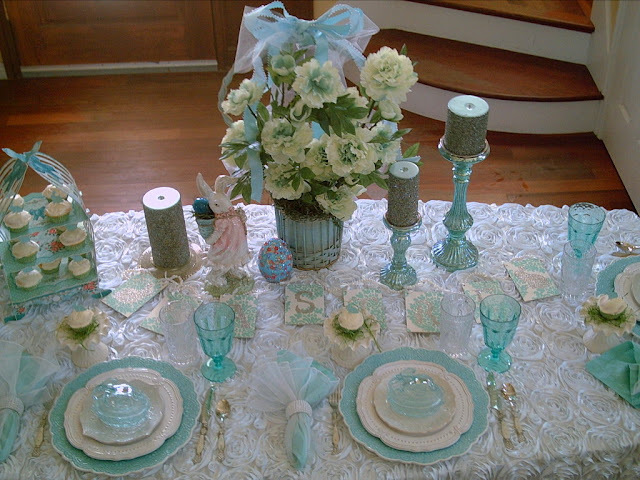 Truly a beautiful table to celebrate Easter. Beautiful! 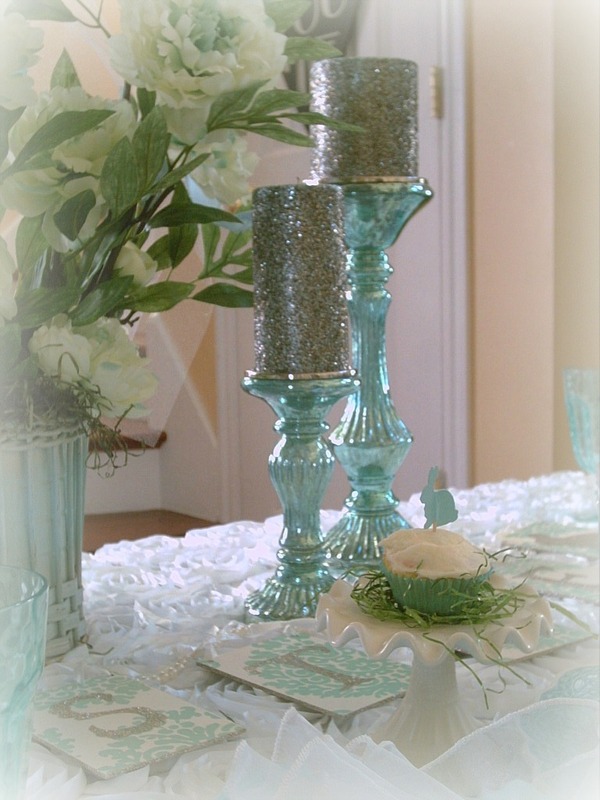 Aqua has been my favorite tablescaping color for a several years now. Your creamy white dinner plates and salad plates look lovely against the aqua charger plates. Thank you so much on the tip about the cream cheese for the frosting. 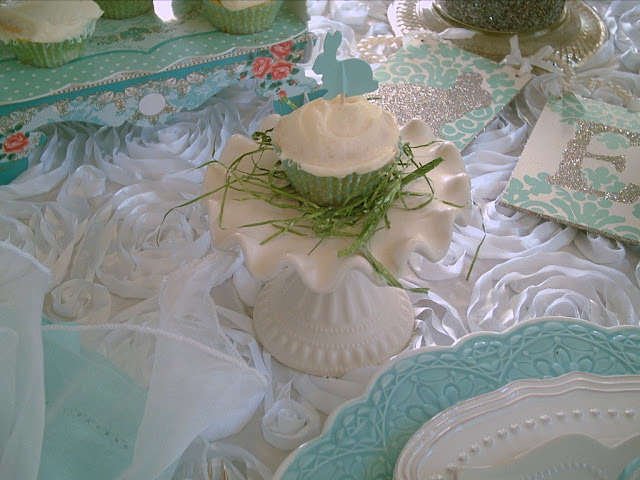 I was getting ready to make my frosting in a few minutes but I think I will take a little time to let a package of cream cheese soften up and make the frosting a little more special. Beautiful and elegant, I love pastel blue with white, it's just so serene for a peaceful and perfect Easter Sunday. The glass aqua rabbit blue bowls in each place setting are my very fave. You're no Bunny 'til some Bunny loves you... So find yourself some Bunny to love. 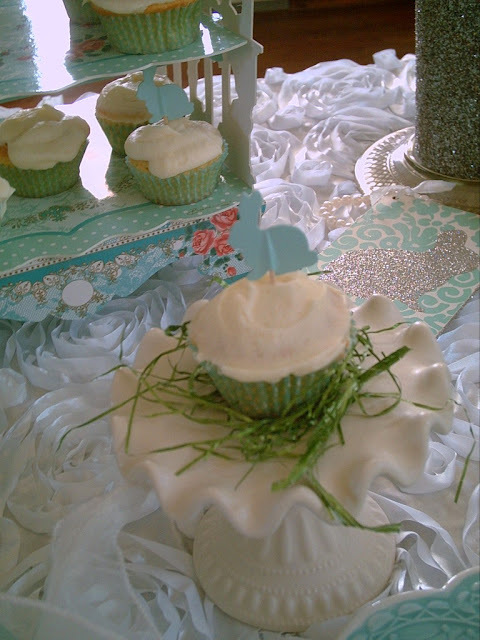 We love your tips and tricks for making the perfect cupcakes. Mmm, thank you for sharing your memories. Reminds us of the good old days. Valerie, you know I love this very elegant table in Aqua. 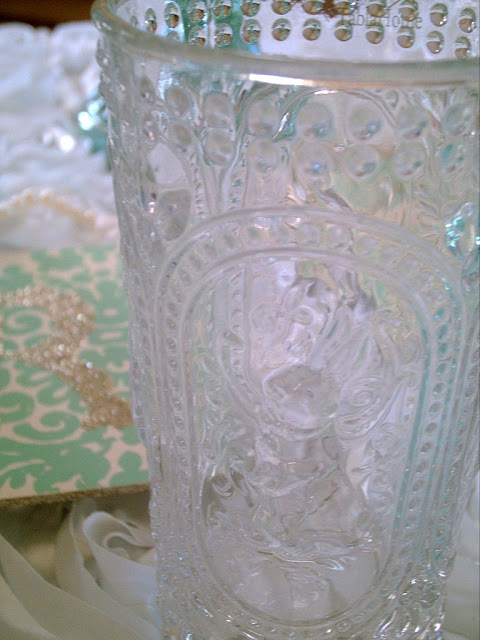 Thank you for sharing this post at DI&DI. Happy Easter. 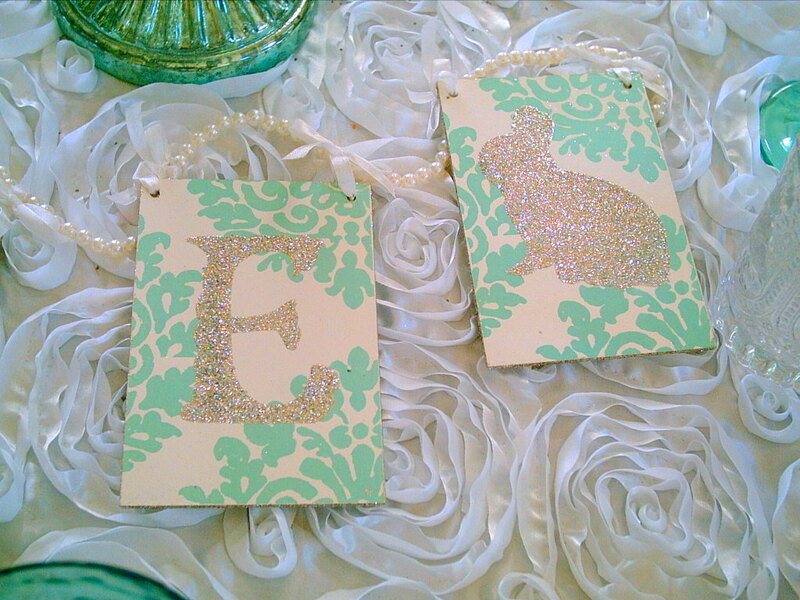 Oh Valerie, this is so pretty! 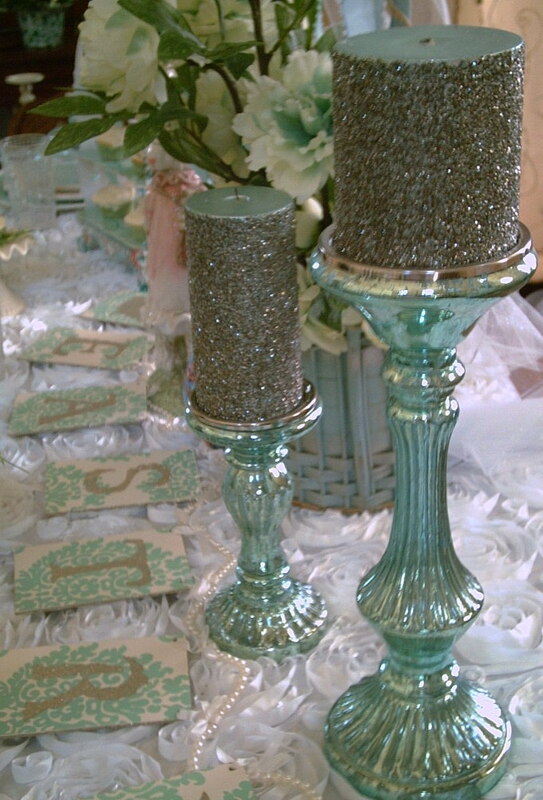 I am crushing over those aqua mercury glass candlesticks, gorgeous! 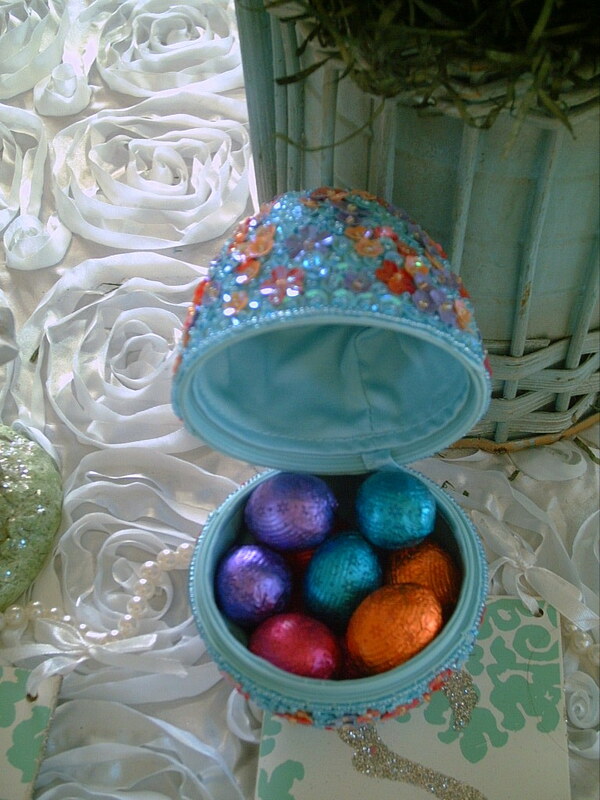 I thought I was following you but I haven't gotten any notifications, I will check on that- hope your Easter was wonderful! Now THAT is a stunning table dear lady! Absolutely stunning. 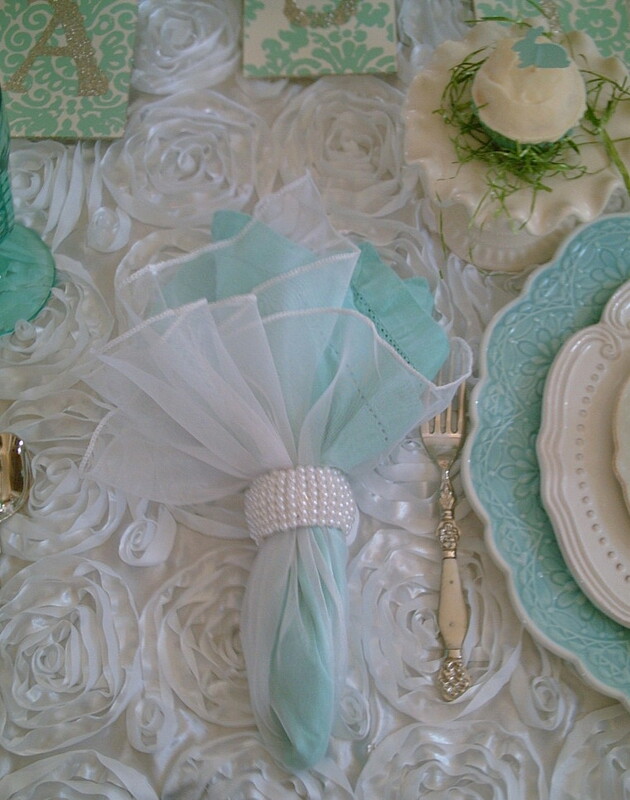 I adore everything on it, the color, those dishes and napkins. Everything! 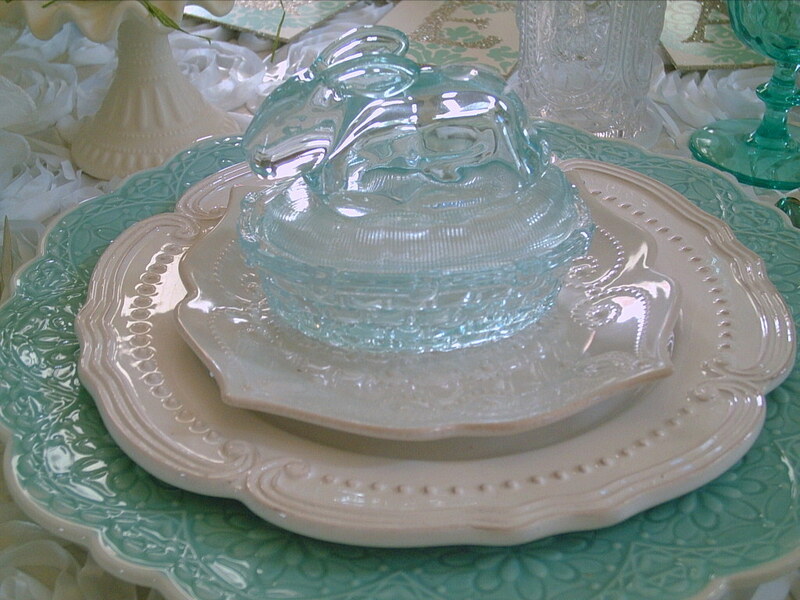 Your table is soft, elegant and a definite feast for the eyes. 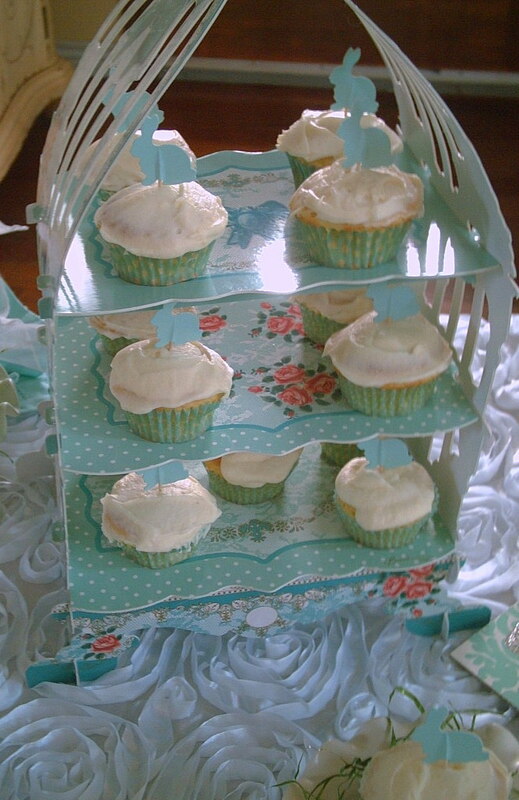 I am seriously in love with the cupcake holder and thanks so much for the baking tips! 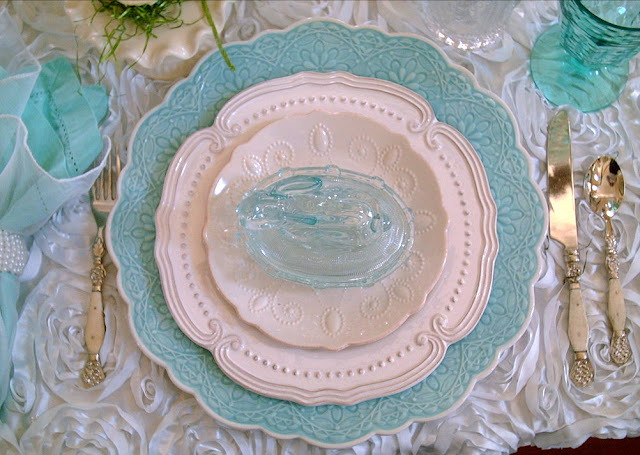 I adore the soft aquas and pinks! 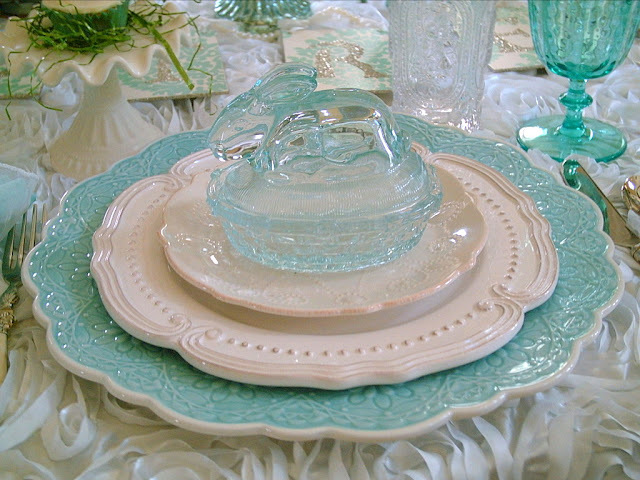 I have those covered bunny dishes too! They didn't star on a table this year, but I think they are just magical. The banner, with a touch of sparkle is perfect. I am going to have to try your suggestion on the chocolate frosting - sounds fabulous! Oh, this is exquisite! The soft aqua is so beautiful. I adore those beautiful glass bunnies, and thank you for the fabulous tip for the cakes, too! I just loved this post. 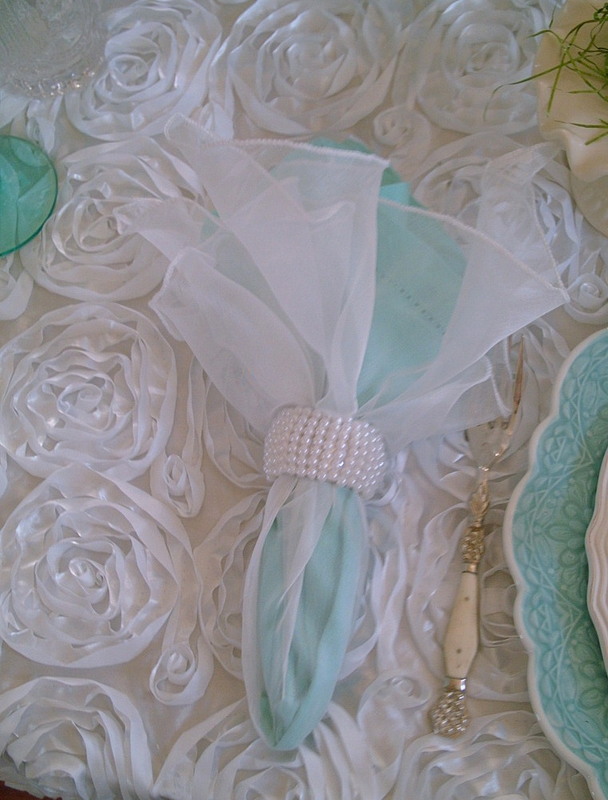 The soft pearly white and aqua tones are luscious together. 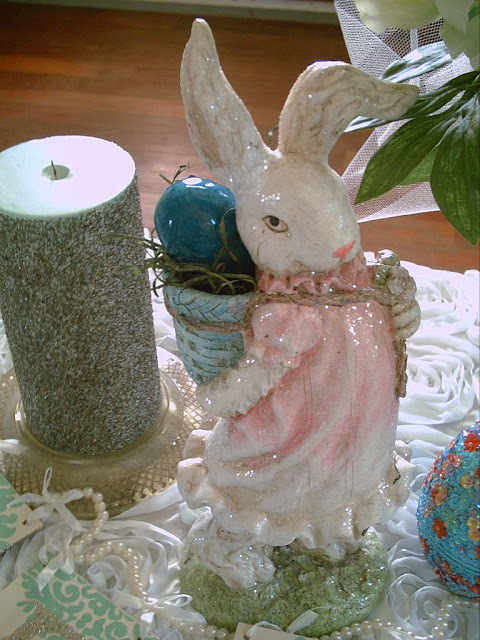 I adore that sweet bunny and the pretty blue egg your grandson gave you. The Easter banner fits perfectly and I love the pearls you added to it. The cupcakes and frosting sound so good. I need to make a note about the little changes that can make the cake taste even better! So very pretty your table. Love the aqua blue. Love your collection of things. Valerie, I am not sure how I missed this post, glad I found it...this has to be one of the best Easter tables this year! 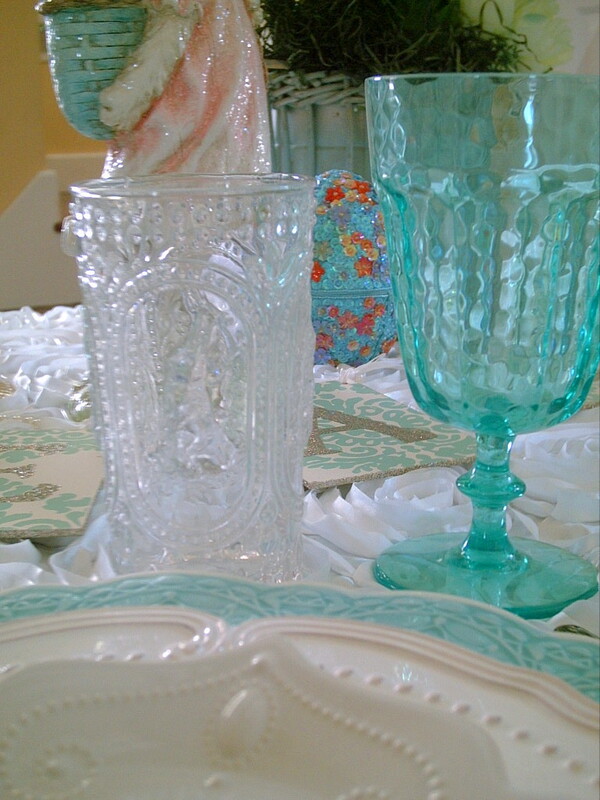 Aqua is my favorite color for tablescapes and this is full of aqua surprises. I love everything about it! Cute what your grandson told you about the egg...are so cute. I love the server you have the yummy looking cupcakes on. Very pretty tablescape - the aqua colour is lovely and you've created a terrific look with it. Thanks for the baking/frosting tips, will have to try those! 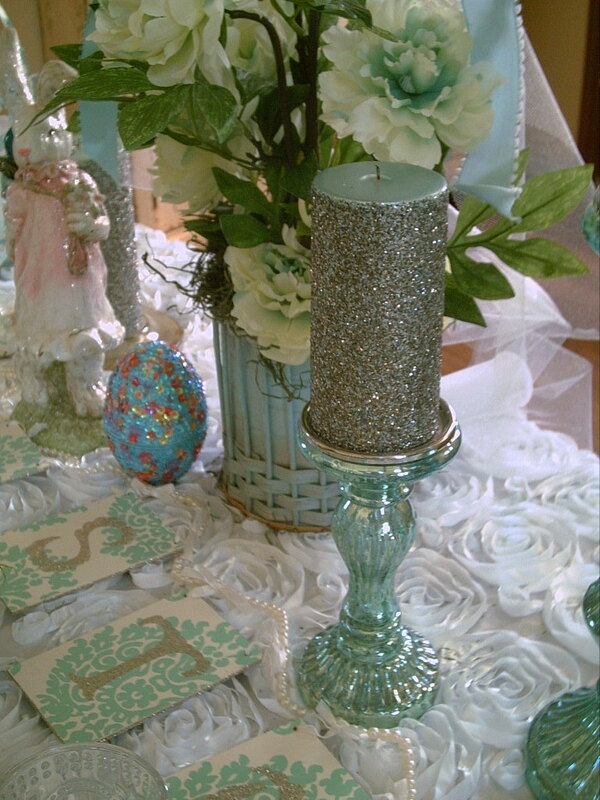 What a beautiful Easter table! 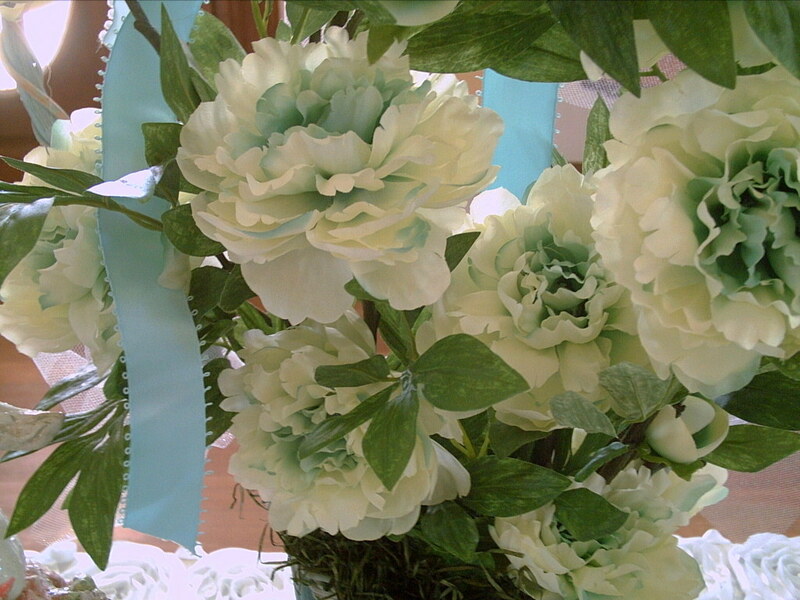 The agua and cream hues are so soft. 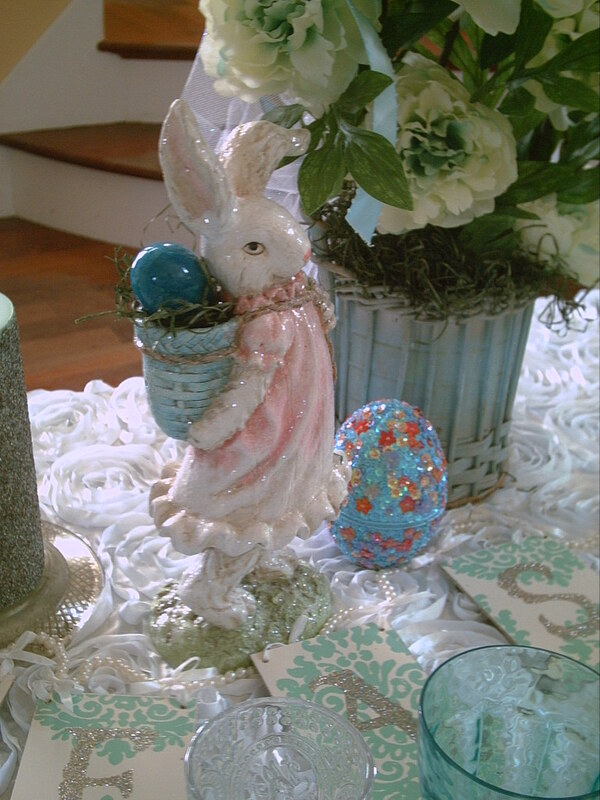 The darling figure with the basket is so precious with the grandson's egg. Thanks for the kind comments about my tablescape! Your question about my placemats is I bought them at Home Goods. 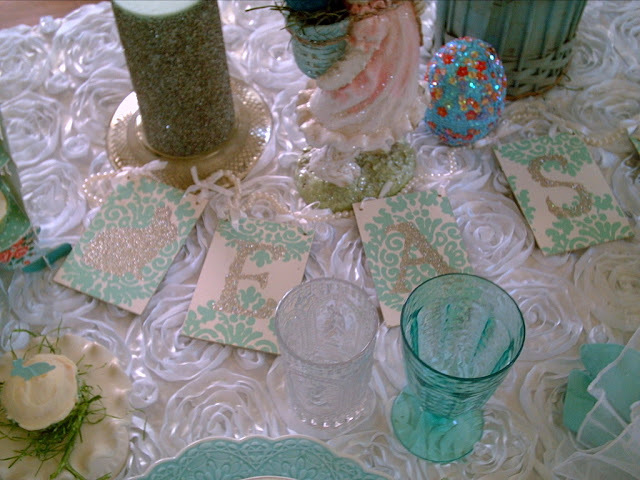 Everything I had on the table was from HG except the vase and flatware. Hope this helps!